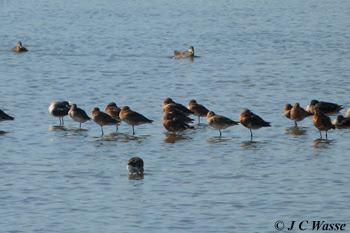 The sign that autumn birding was on its way came in the form of the passage of waders through the UK over recent weeks. Rainham Marshes RSPB, London held a variety including a long staying Wood Sandpiper during August 2015 with Common and Green Sandpipers sharing Aveley Pools. Dunlin and LR Plover completed the small ones here and Greenshank, Ruff, Redshank and Black-tailed Godwits were bigger ones present. Not forgetting a handful each of Whimbrel and Curlew favouring the Thames shore or Purfleet Scrape. Main focus on the 50 or so strong flock of Black-tailed Godwits roosting and feeding in the shallow water of Aveley Pools sporting a variety of plumages. A turn over of birds during August with at least 4 colour ringed individuals. It's been fun and a challenge at times to identify their combinations as the strong light, heat haze and distance to the flock proved problematic. Debate about the lower ring colour. Looks like the above combination is favourite. Female ringed in Iceland in May 2010 wintering mainly in Sussex, UK with sightings in Hampshire, Kent, The Wash and the inner and outer Thames Estuary. Seen at Rainham Marshes RSPB in August 2015. Debate on combination as well, likely to be as listed above. Male ringed in November 2012 in Portugal, wintering there in subsequent years. Observed in Dordrecht, The Netherlands in March 2015. Seen at Rainham Marshes RSPB in August 2015. Possibilities being considered. Await further details. 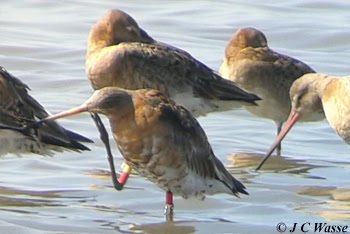 Adult male ringed in Iceland in July 2010. Wintering on the Swale Estuary, Kent, UK since. 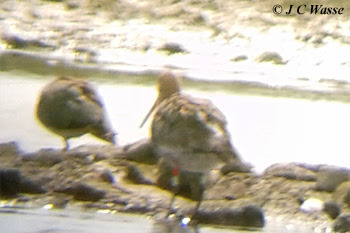 Seen at Rainham Marshes RSPB in August 2015 (and still present on 05 September 2015).